Meet Wei lIU and Yuwei Zhao, TWO cHINESE STUDENTS AT THE uNIVERSITY OF tWENTE. Wei Liu and Yuwei Zhao ARE PART OF OUR INTERNATIONAL STUDENT AMBASSADORS TEAM, AND THEY ARE HERE TO HELP YOU. Read about their stories below. The guy who just wants to be the big brother. Till this moment it is the third year of my study life here in the Netherlands ever, since my arrival in the year of 2016. It was also the first time that I came to another country for study other than China. Everything is new here, everything I need to learn and get used to. Fortunately I made it successfully and I’m doing quite okay now! Thanks for the past two years, which literally made me a different and even better person, at least from the bottom of my heart I felt this way myself. I enjoyed all the days I had and looking forward to the days in the bright future, the people, opportunities, all kinds of staff, the world is wild open for me! There is no surprise for my decision choosing the Netherlands as the abroad study destination. The Bachelor's programme I did in China was a cooperation programme between Saxion and my previous university. I was doing quite ok on my Bachelor's and I have the ability to speak English, and the following was just meant to be. I did have opportunity to finish my study in China, so I gave it a lot of thoughts. The facts of this country that attracted me are firstly: the acceptable tuition costs, secondly: the high level of English usage and lastly: the higher safety level than other countries. I’ve always wanted to go abroad for new knowledge and skills in order to improve myself and widen my future career direction. The advantage of the Netherlands eventually convinced me and brought me here. In my personal perspective, the campus of University of Twente is the most attracting point for Chinese students, since this is what we were used to back in China, let alone that UT is one of the 3 best Dutch technical university. As for myself, I finished my Bachelor's in Saxion and then turned to UT for my Master's. This was easy because of the location and I’ve been to UT's Master's Open Day, which I found really useful for potential students. Overall I saw the ambitions of the university and it really becomes more open to the world and tries to gather all talented young people to give them better education and make a better world through their hands! So here I am to be one of them! The study part is interesting and challenging since UT really applies the educational idea “High Tech, Human Touch” into its education system. This means that all research, projects are solution-based. You have to work with your team to find solutions and alternatives for problems. Usually the problem is extracted from real cases (provided by companies or other organizations). Personally, in my own study field, I gained knowledge about new technologies, applications, design and management concepts on civil engineering and construction management, which will be supportive for my future work. Apart from study, as a student in UT, your life can be a lot easier due to the campus (your daily life needs can be easily fulfilled). The ACSSNL (Chinese Students & Scholars Union in the Netherlands) always organizes events for traditional Chinese festivals to enrich students’ spare time. You can also develop your other talents using the facilities provided by UT, sports, musical, dancing, art et cetera a lot can be found here, through which you can make new friends from all over the world. Nihao! I am Yuwei Zhao from China, currently a student of the Master's programme Communication Studies at the University of Twente. Before starting my new journey at the University of Twente, I lived in the Netherlands for six years. I have completed my Bachelor's studies in International Communication at Hanze University of Applied Sciences, including a-half-year study exchange in Seoul, South Korea. Living abroad brings me face-to-face with a different culture and customs. These differences can seem interesting and quaint at first, but they are part of my daily living now. There are a number of different options to take as you contemplate what to do after your Bachelor's. After the completion of my Bachelor's degree in another Dutch city, I had a long time to decide what to do next. In the beginning, I wanted to start my career. However, after a while, the competitive nature of the jobs market made me realized that I need to expand my knowledge and experience. After gathered advice from friends, teachers, and career experts, I decided to follow a Master's programme. I hold a Bachelor's degree in International Communication. I really enjoy the communication field and I also want to be better in the field. After researching several Dutch Master's programs in the communication-related field, I chose the one of the University of Twente because I liked the course structure this university takes to my program. Moreover, the University of Twente is special and unique compared with other Dutch universities. The facilities here are second to none. The University of Twente includes a campus with the hustle and bustle of a small metropolis is a perfect choice for students to live and work in. The UT campus is perpetually in motion. As an amazing result, the University of Twente currently has almost 40 different sports clubs. No matter you want to swim, wall climbing or even survival game, UT campus helps you to make them come true. In my spare time, I enjoy sitting on the grass while reading books or walking around the campus and enjoying the beautiful views. The beauty of the UT campus changes with the seasons, whether it is the leaves on the trees turn a beautiful golden color, fall and disappear, or the sunlight there is reflected off the snow, the campus is always beautiful. Do you have a question for our students? Contact them via our dedicated Chinese WeChat (utwente), Weibo or Facebook page. 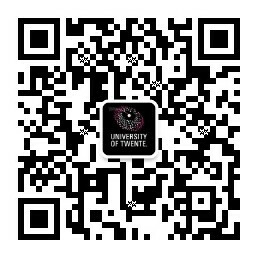 For more information about the University of Twente you can also visit our Chinese web page.